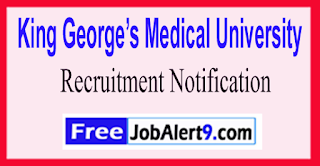 King George’s Medical University has published a latest applications for recruitment to the post of Assistant Professor, Professor and Associate Professor. The candidates eligible for the post can apply in the prescribed format on or before 5 March 2018. Interested and eligible candidates must read like recruitment notification Qualification/ eligibility conditions, how to apply & other rules are carefully from official website so read bellow and follow the link. Educational Qualification & Experience: Candidate should have passed Master’s in concerned discipline along with PhD in relevant field. Teaching and research experience is essential. How to Apply : Eligible and Interested candidates can apply Online applications will be accepted through the official website of KGMU. the last date for application is 5 March 2018. Applicants’ are also required to send the print copy of relevant documents to Registrar, king George’ S Medical University, Lucknow ‘ within 15 days of application. Last Date to submission for Application: 5 March 2018. 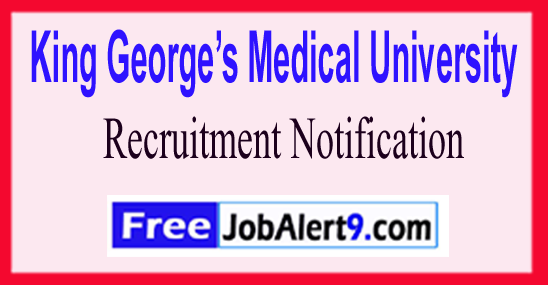 KGMU (King George’s Medical University) Has Released Recruitment Notification For 05 Research Scientist, Lab Assistant Posts. All Eligible & Interested Candidates Can Apply Offline.Further Detailed Information Regarding Educational Qualifications, Age Limit, Selection Procedure, Exam Pattern, Syllabus for KGMU (King George’s Medical University) Recruitment 2017 - 05 Research Scientist, Lab Assistant Post is mentioned below. Candidates should have done 10th or 12th or Diploma or Post Graduation Degree / its equivalent qualification from A recognized university. Rs. 58,900/- (Post 1), Rs. 48,469/- (Post 2), Rs. 18,360/- (Post 3), Rs. 16,179/- (Post 4) . All Eligible & Interested candidates must send by hard copies of application along with relevant testimonials (Mentioned In Detailed Advertisement) to the following Address before / (3rd July 2017). After Filling The application form, candidate must send soft copies of application a long with relevant testimonials to the following Email Address before/ (3rd July 2017). King George’s Medical University . Last Date of Receipt of Applications- 03-07-2017. Date for Interview - 10-07-2017. Click Here For KGMU Recruitment 2017, Advertisement.